Parkway's James Harford, Simon Law and Stuart Popple are all smiles after winning the Bowls England national triples title at Leamington. Parkway’s James Harford, Simon Law and Stuart Popple are the new Bowls England men’s triples champions. 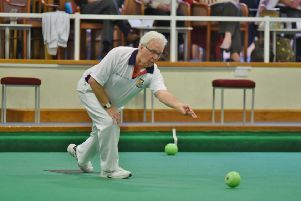 The city bowlers swept to the title at Leamington with a 16-10 victory in the final over Leicester’s Ken Frost, Roger Cooper and Shane Hayes, and will now represent England in next year’s British Isles championships. It was fourth time lucky for Popple, who had previously been beaten in the final of the national junior singles, pairs and mixed pairs. Having watched wife Catherine enjoy considerable success over a number of years at international and national level, including medals at both the Commonwealth Games and Atlantic Championships, he fully deserved his moment in the spotlight. A former England junior international – he played one series in 1993 – Popple’s calm and collected approach proved the ideal foil for his younger allies’ more adventurous nature and the blend proved a potent mixture. It was only Hunts’ second triples success at this level, the other achieved back in 1991 by Huntingdon St Peters. It was also the Parkway club’s first national title, the recent successes for Tristan Morton having been under the Warboys flag. In the semi-finals, Parkway were 17-13 winners over Hertfordshire which followed victories over Somerset (18-12), Warwickshire (18-16), Wilts (18-16) and Cambs (15-14). Hunts had both triples in the quarter-finals, but the Warboys trio of Ian McWhinney, Lewis Baker and Nicky Brett were beaten 19-12 by Suffolk after they had beaten Essex (20-9), Oxfordshire (24-14) and Hants (22-11). In the fours, the Warboys quartet of Simon Leader, Ean Morton, Nicky Brett and Tristan Morton reached the third round, where they were pipped 18-17 by Northumberland having beaten Oxfordshire 27-6 and Durham 34-8. The other Hunts rink, Brampton’s Kierran and Trevor Murray, Robbie Coleman and Barry Kitto, exited at the first round stage, 21-15 to Durham. In the senior singles, Parkway’s Trevor Collins was beaten 21-17 in the opening round by Cornwall’s David Drew, who went on to win the title. A new initiative introduced by the Peterborough League will see their Midweek Premier Division champions, Whittlesey Manor A, facing the Spalding League winners in a special Champion of Champions challenge match at the Market Deeping club on Wednesday, September 9 (6pm). It’s hoped it will become an annual event with the possibility of it expanding to include other neighbouring leagues.